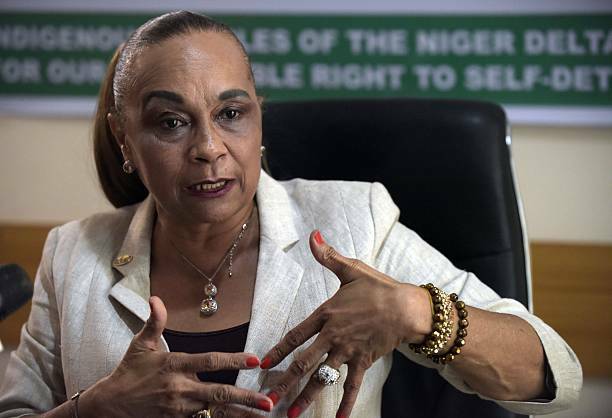 Against the backdrop of the recent pronouncement by the Federal Government that all is now set for the Ogoni clean-up project, foremost Niger Delta activist, Annkio Briggs, has accused the government of using the project as a campaign tool ahead of the 2019 general election. In this interview with Sunday Sun, Briggs said that President Muhammadu Buhari would not get the support of the people of the South-South zone, warning that the people would vehemently reject any result that is against their will. The Federal Government recently said that it is now set for the commencement of the Ogoni clean-up project. How would you react to the development? The Nigerian government or any of its agencies that is associated with anything that has to do with petroleum and gas, does not have the capacity to clean up any environment not to talk about the Ogoni environment. What I am, therefore, saying is that if they say that they are ready, it then should mean that they are ready to give out the contract to legitimate, renowned international companies that have cleaned up swamps, mangroves, land and drinking water elsewhere in the world. Such companies must have the track record of having done this kind of job before outside Nigeria. As I speak to you, there is no Nigerian company that has the capacity to clean up the level of devastation that has happened in Ogoni land and in the rest of the Niger Delta area. So, when I hear that the Federal Government says it is ready for the Ogoni clean-up project, I know that it is not true. If it is not equipped with the things that I have mentioned, and in the ways that I have expressed it, then the Federal Government is lying. Thatâ€™s one. Two, one of the campaign promises of the Buhari administration in 2014 were that if it comes in, it would kick-start the process to clean up of the Ogoni environment. Now, this is because the UNEP report was done by the United Nations. The UNEP team had used Ogoni land as an entry point and they spoke to a lot of people, including Ogoni people and non-Ogoni people. I am one of those they spoke to during their research. They also spoke with people like Ledum Mitee, the late Orono Douglas and so many other environmental activists. All of these packaged together formed the UNEP report. The UNEC report came up in 2008 or thereabout. So, it came out even before the administration of former President Goodluck Jonathan. The money attached to the report was estimated before the naira depreciated to N365 to a dollar. So, the cost of cleaning up the environment is almost four times what it was at the time that the report was written. Therefore, the question is has the Federal Government or the oil companies got the money to clean-up the environment? If not, what that means is that one way or the other it is still the Niger Delta people, the Ogoni people, the devastated people that will fund the clean-up whenever it happens. When the Vice President came to flag-off the project in June 2016, all that he did was to pull a piece of cloth across a plaque that says â€˜the environmental clean-up of Ogoni landâ€™. As I speak to you now, there is no clean-up going on and there will be no clean-up going on. We are going into the 2019 general election and Buhariâ€™s government and his party, the All Progressives Congress (APC), are at their game again. They made promises in 2014 and four years on, they, like every other past government, have not cleaned-up Ogoni land or any other land for that matter. So, in very simple term, the clean-up of Ogoni land and the clean-up of the devastation of the Niger Delta has become and will remain just a campaign discussion for people who donâ€™t know what it is to drink polluted water, breathe polluted air and eat fish that has been polluted. They are lying. But as you rightly observed, the project is capital intensive and the government had explained that it needed time to raise the needed funds. It has reportedly raised about $177 million for the project with Shell donating the largest sum and is now at the stage of awarding the contract. Donâ€™t you see this as a sign of seriousness and commitment towards the execution of the project? First and foremost, it is an insult and unacceptable for Shell to say that it is donating money for the clean-up of an environment it is totally 100 per cent responsible for its devastation. Secondly, the Federal Government is a joint venture partner with oil companies that operate in the Niger Delta; they are joint venture partners of 60 per cent to the Federal Government and 40 per cent to the oil companies; we the owners of the oil have nothing. Now, if the Federal Government is going about begging for money to clean-up Ogoni land, the question is what has it done with the 60 per cent share it owns in oil and gas exploration? The Nigerian government has no business trying to raise over a hundred million dollars for the clean-up of Ogoni land; it is like a drop of water in the ocean of the clean-up of the Niger Delta. How dare they talk about raising money for the exercise when they are wasting more than that in places where Boko Haram had destroyed; when they are using more than that to rehabilitate the insurgents or fight Boko Haram that they are technically defeating and Boko Haram is still killing hundreds and hundreds of soldiers and other human beings. This government is not sincere; the government is lying. Before now, no other government had come this close to the clean-up of anywhere in the Niger Delta. Is there any justification in accusing this administration of insincerity as regards this project? There is justification because saying that you are travelling and actually travelling are two different things. If you are at the airport, but have not boarded your flight you have not travelled. So, if the Federal Government is saying it will and it has not then it has not. We cannot live on the expectation that it will. It should proceed and since it has not proceeded in the past four years, I donâ€™t have any reason to believe that it will until it does. Even if it starts, until it actually finishes the clean-up, it has not started as far as I am concerned. You need to live in the Niger Delta; and you need to breathe what we are breathing and eat what we are eating before you can talk about Niger Delta issues. I grew up, lived and have worked in the Niger Delta all my life. I grew up in the Niger Delta before oil was exported in commercial quantity. I know what my community looked like before they started exploring and exploiting oil; and I now know the price my people and I are paying. And we are saying actually that we would prefer a situation where there is a moratorium on oil and gas; we have been saying it for a very long time. What is the big deal about oil and gas? Why canâ€™t they leave it alone? Why canâ€™t they grow cocoa? Why canâ€™t they grow groundnut? Why canâ€™t they export ginger and other produce? Why must it be oil and gas? Away from Niger Delta issues, the forthcoming general election, especially the presidential election is widely seen as a straight fight between the ruling APC and opposition Peoples Democratic Party (PDP) in spite of the multiplicity of candidates. Which of the two parties will likely get the support of your people? The sentiment of the electorate in my region and in the Southeast as well, but let me speak for the Niger Delta, is very much a PDP sentiment. So, having known this and having known as well that today, Nigeria is clearly divided along the lines of religion and ethnicity, and along the lines APC and PDP, I can authoritatively tell you that Rivers, Akwa Ibom, Delta, Bayelsa and to a large extent Cross River states are all definitely PDP states. Are you saying that the South-South will vote for PDP in 2019? Absolutely! I mean even in the election that brought Buhari in, the South-South voted overwhelmingly for PDP. So, what has changed? Their situation is worse in 2018 going into 2019 in the areas of the economy, security, political inclusiveness, injustice, human rights abuse and all of that. The situation is worse now than it ever has been in Nigeria. The situation is worse now than in 2015 when Buhari came to power. So, what makes you think that for some reasons people will wake up in 2019 and all of a sudden Buhari will win elections in Rivers, Delta, Bayelsa and Akwa Ibom states? Buhari is not going to win elections in the Niger Delta. Anybody that counts votes and claims that Buhari has won election here is looking for trouble because itâ€™s not possible. He can never win elections here. I am not saying that some South-South people are not working for him. There are misguided South-South people that are working for Buhari. But their misguided-ness is not enough to win elections for Buhari here. One or two people will vote for Buhari, but he will not win in the South-South. That is why we are seriously concerned that they are going to foment violence; thatâ€™s the way they are going. They are going to rig the elections. The election is not going to be free and fair. On the governorship election, I can tell you, for instance, that there is no way Governor Wike will lose any election in River State. You can quote me. It is impossible for Wike to lose elections in River State. Even if my father wakes up from his grave and stands election against Wike next year, he will not win. So, any attempt to claim that Wike lost election in Rivers is an attempt to destabilise the state. Thatâ€™s why we are cautioning that the elections must be free and fair. People must be allowed to vote for whomever they want. So, we are worried about the violence they want to perpetrate. But we will not accept any result that is contrary to the will of the people. Your submission was based on what was on ground in 2015. As it is today, in Rivers, all the three senators have moved to the APC; in Akwa Ibom, two of the senators have also moved to the APC while there have been high profile defections from PDP to APC in Delta State. Donâ€™t you think that the trend has changed and will influence the voting pattern in 2019? The trend has not changed. All of these things are manipulations and mago-mago. The trend has not changed one little bit and will not change. Rivers people know what they want; they will not vote for the APC governorship candidate and definitely they will not vote for Buhari. Now, when you talk about senators, even if a senator is an APC senator, it would not make Buhari to win an election. People can vote for their candidates in any party they are and then refuse to vote for Buhari, which was what happened in 2015. And Buhari himself said it, that we are the five per cent that didnâ€™t vote for him. This time, I can assure you that less people will vote for him. And even if all the three senators from Rivers State are in APC, donâ€™t forget that there is carpet crossing and you never know what will happen tomorrow. Secondly, these are Rivers sons and daughters and elections are coming up. It is still the same people that will vote. So, the fact that the three senators from Rivers are now in APC does not mean that they will remain in APC. It does not mean that Rivers people will retain them. And even if they retain them, so what? It does not mean that Buhari will win, because voting for Buhari and voting for a senatorial candidate are two different things. You are voting for a senatorial candidate for a different reason and a presidential also for a different reason. So, what advice do you have for the electorate as the country inches closer to the general election? My advice to everybody who has registered to vote is to first of all make sure you collect your Permanent Voters Card (PVC). Secondly, it is foolish by all accounts to sell your votersâ€™ card or your voting right to anybody for any amount of money. Thirdly, people should come out and vote for the candidate of their choice. At the end of the day, I will definitely want everybody to stay alive after the election. Former President Jonathan said in 2015 that his political ambition was not worth the blood of anybody. So, people should not die because they want to vote in an election. I will not advise people to die because they want to vote in an election. But if we are cheated out of the process of wanting to exercise our right to vote, we should not accept that. And thatâ€™s what I meant when I said that we would not accept any result that is against the will of the people.